The MLK Commemorative Series is inviting Vanderbilt community members, including faculty, staff, postdocs and graduate and professional students, to submit proposals for teach-ins to take place on Martin Luther King Jr. Day. The interactive sessions will be aimed at facilitating meaningful, tangible action toward desegregation, inclusion and equity. The MLK Commemorative Series teach-ins subcommittee will select three submissions to be included in the Jan. 21 event and receive a $500 stipend. Proposals are due by Nov. 16. 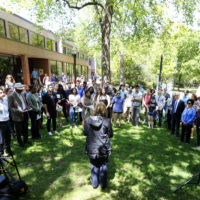 The teach-ins are part of Vanderbilt’s annual celebration of the Rev. Dr. Martin Luther King Jr. and his commitment to the values of racial justice, equality, freedom, inclusion, compassion and service to humanity. Every year, on the third Monday in January, Vanderbilt students, faculty and staff gather for a series of programs, including a city-wide march, community service, educational forums and lectures. In addition to the teach-in sessions, this year’s program also will include a keynote address by White House correspondent and CNN political analyst April Ryan. The MLK Committee, which consists of staff, faculty and student representatives, has developed the theme “Our Lives. Our Movement. Our Responsibility” for the 2019 celebration. First established in 1985, the MLK Commemorative Series affirms Vanderbilt University’s commitment to the goals of peace and racial justice to which King dedicated his life. To learn more about the programs and events being planned for MLK Day 2019, visit the MLK Commemorative Series website. For any questions related to the teach-ins or submitting a proposal, contact Carol Ziegler.